Our Soft Frosted Cookie features a creamy and colorful frosting with vanilla and butter flavors atop a sweet, textured sugar cookie base. Perfect for anyone with a sweet tooth, this cookie is the two things customers are looking for...soft and delicious. These individually wrapped, incredibly soft, 3.5 oz. 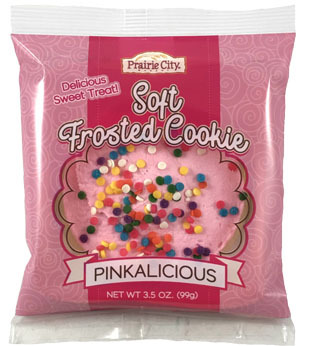 sugar cookies offer sweet, buttery icing and sprinkles that melts in your mouth for a rich, sweet taste experience. The bright, eye-catching packaging offers a compact counter merchandiser that makes for an easy impulse purchase display point. With only a 10 count box, the small pack size makes it easy to go from tote to shelf.